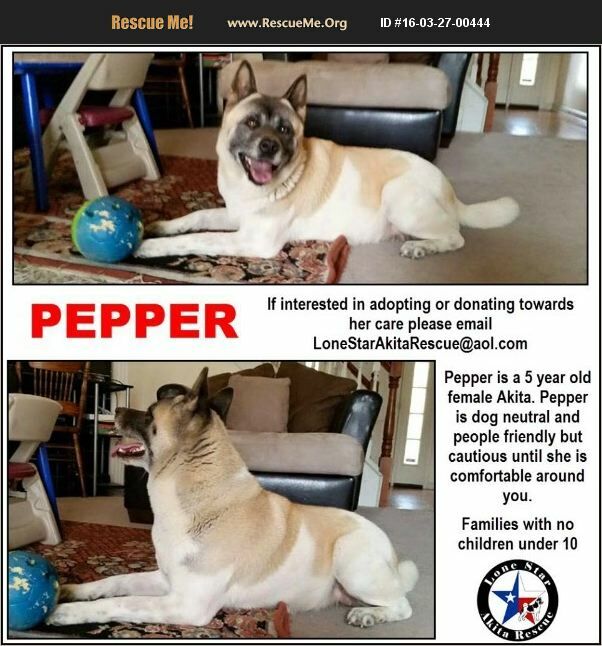 Pepper is located in Alvaredo, TX. She is a 5 year old female Akita that needs to be an only pet. She does take time to warm up and acts very cautious until she can trust you. (That is what the shelter workers have reported) The shelter she was at also reported that she loves to play fetch and even brings the ball back every time! We have videos of beautiful Pepper to share, just ask! Pepper will need to be placed in a house that does not have children under the age of 18. Adoption Applications can be emailed to LoneStarAkitaRescue@aol.com Print the app from this link: https://goo.gl/3MYgDk Or ask to have one emailed to you. Each dog is fully vetted prior to placement. At a minimum, this includes heartworm check, vaccinations, spay/neuter, and microchip. Any other medically necessary services are also performed.